Cheshire’s seaside resort is New Brighton, part of Wallasey. Wallasey is credited in some sources as having the first Leyland Atlantean PDR1/1 in public service, and here is: FHF 451. It dates from 1958 and has a Metropolitan Cammell H77F body. A legend surrounds the peculiar colour. Many of us would regard it as a yellow, and I understand that, to distinguish them from those of the neighbouring Birkenhead blue buses, Wallasey’s were known as the yellow buses. It is – officially – sea green. According to legend, one of the first trams was about to be painted, and the unfortunate operative asked the foreman what colour of paint he should use. The foreman had no idea, but he knew that the manager, a Mr Green, would know what he wanted, and told the painter to "See Green", which he promptly applied. The second view shows the fleet name and Crest. Both photographs were taken in North Albert Street, Fleetwood, on the Tram Sunday of 19 July 1998. At Kentish Bus I worked with an accountant who came from the Wirral. His view was that the bus livery reflected the quality of the water at New Brighton (I won’t repeat his exact words). So yes, Sea Green indeed. Thank you, Roger. I think the imagination can cope! To add a little more amusement to the proceedings, Wallasey Corporation Motor’s General Manager’s full name was Colonel Richard Roughley Greene and his two last names aptly describe the conflict about what colour Sea Green actually is! My version of the story was that it was the first buses, and the Leyland representative asked the question, but whatever! It is slightly reminiscent of the story of the umber colour of London Brighton and South Coast Railway locos, officially (?) described as "Stroudley’s improved engine green". A Journalist enquired of an employee: ‘How would you would you describe the colour?’ The poor fellow had no idea, so he suggested that the question be directed towards the general manager. ‘See Greene’, he replied, so sea green it became! Such is the stuff of legend!!! When Southampton Citybus, as it had become by then, fitted tanks on the roof to G prefix Dennis Darts, and First Group provided some N prefix ones, locals asked drivers why these tanks were appearing. One driver said they were air tanks, ready for use on the submarine service to Cowes, in competition with Red Funnel. The story soon spread! A colleague had worked for St Albans Council. He and some others were doing a survey of the high street, in preparation for paving renewal. Some one asked what and why. The reply was that it was ready for the extension of the runway at Luton Airport. You can imagine the letters to the local rag that followed . . .
And thanks to her owners the 201 Group she is a regular in passenger service at Rallys, possibly the oldest Atlantean still in passenger use next to the PMT preserved example? Wallasey 1 is without any doubt the earliest Atlantean still carrying passengers. Glasgow LA1 is the only other surviving of the four shown at the Earl’s Court show in 1958 and Glasgow Museums do not allow passengers. 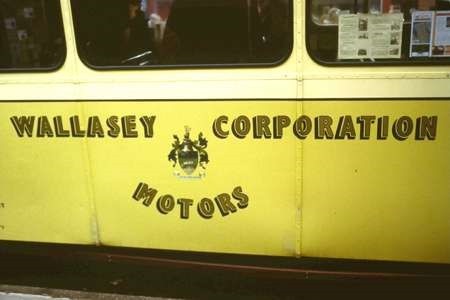 The 75 buses of the quaintly named Wallasey Corporation Motors was absorbed – along with those of the Corporations of Birkenhead and Liverpool – into the newly formed Merseyside Passenger Transport Executive on 1st December 1969. On an enthusiasts’ visit the following August I photographed this pair of Leyland Titans, still wearing their original livery and fleet names. I think they make an interesting comparison. On the left, 78 (BHF 497) is a PD2/12 with Weymann H30/26R body new in 1952. 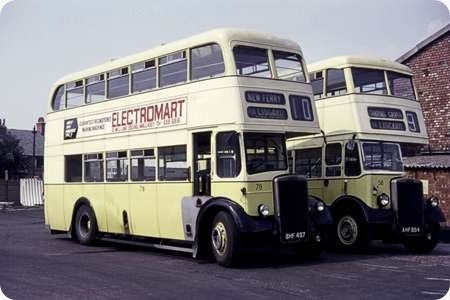 To the right, 58 (AHF 854) is a PD2/1 with Metro-Cammell H30/26R body new in 1951. It is quite amazing to me that this pair – both bodied by companies associated through the MCW group – were built within a year or so of one another, the design of 58 being a throwback to the early 1930’s yet still being built in 1951. Admittedly that on 78 can possibly also partly trace its origins back to a Weymann design of around 1939, such as that used on Brighton Corporation’s famous FUF-registered Regents and others, but how much more modern it looks. What is equally amazing is that some eight years after 58 entered service, Wallasey had one of the first production Atlanteans – a massive jump in design in an always interesting fleet. What a super pair! I was taken on holiday to New Brighton in my early years and still remember the Wallasey fleet such as those pictured. Just a pity the PTE had removed the ornate ‘Wallasey Corporation Motors’ fleetname from the side. Only 75 buses but one of the first Operators to put an Atlantean in service (another contender being the even smaller fleet of James, Ammanford). I think it was in Meccano Magazine that a photo showed a temporary ‘gangplank’ being used at Seacombe ferry where the buses reversed up to the loading points thus enabling passengers to board fleet number 1 in safety. Massive route numbers, didn’t Birkenhead have large ones as well? Perhaps lots of short sighted passengers on the Wirral? West Bridgford did big route numbers too – as did Douglas IoM. You could tell from three stops away whether it was your bus approaching or not! Much better than scrolling digital displays that include bits of advertising and strange route descriptions instead of numbers. Growing up in Liverpool with its 1,200 corporation buses, the Wallasey fleet ‘over the water’ was always fascinatingly old fashioned in feel and looks, even featuring a clock on the platform giving the time of the next ferry. Always remember that when a ferry unloaded at Seacombe and the lined-up buses filled up, a Wallasey Corporation inspector would blow his whistle and every single bus would pull out, in convoy, bound for the posh Wallasey suburbs or New Brighton. I grew up in Wallasey in the fifties and remember the affection we had for our bus fleet. The shared routes such as 9, 10 and 11 with Birkenhead would always cause conflict with yellow and blue buses leapfrogging in rush hour to maximise custom. I recall the annual outings to Helsby when at least 10 Wallasey buses would take us urchins on a day out with a slap up tea and games, I would try to get an upstairs front seat and if possible on bus number 80 which was my adopted favourite. The interesting thing about Mr Anon’s description of the look and feel of Wallasey buses is that in 1958, of course, Wallasey Corporation Motors was the first operator in the country to put a new-fangled rear-engined double decker into service. But step aboard that bus, and its interior is just as "fascinatingly old-fashioned in feel and looks" as everything else was. I grew up in Wallasey in the late 50’s, 60’s. We used to call the Atlanteans the ‘new buses’. Later in 1974 I trained as a bus driver with MPTE. We were called Instant Whips by the older drivers because we had never been conductors. I often drove some of the original Atlanteans which were still in service. Historic but not as nice to drive as the new ones which we called Jumbos. Later I drove for Crosville where they still had lots of back loaders and conductors. I then drove for Henry C Cox of New Brighton, one of the nicest men and best boss I ever had. Dan, I grew up in Wallasey in the 60s and 70s, and remember well the period you mention. I was wondering though if you know what happened to the Cox’s Coaches business? We used them for trips to Blackpool and Lancaster, but the seem to have vanished without trace. I was asking around about then at the end of last year, but no one I spoke to could recall them. Has the Weymann been re-paneled below the lower deck windows? I think the Weymann flared skirt must have been an option. I have just checked Alan Oxley’s book on Midland General/Notts & Derby Traction. All the pictures of post-war Regents with Weymann body (of which they had quite a lot) were without the flare. Some of the photos are of early date, so unlikely to have been re-panelled. I assume the same was true of Mansfield District, in the same Balfour-Beatty Group. We too lived in that neck of the woods from the mid 60s onwards. 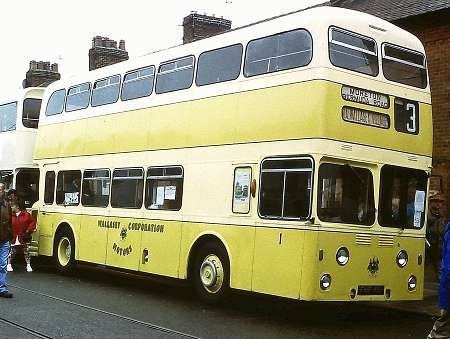 The Wallasey bus colour was known as either "yellow" or "white" by various locals. Of the early Atlanteans, there were eventually 30, but I believe those were the last mainstream buses purchased until MPTE took over. They mainly held down the various routes out to Moreton, where you rarely saw one of the older vehicles, and some of the trunk runs between Seacombe and New Brighton. Everything else was the old half cabs. The departure from Seacombe every 10-15 minutes, following each ferry arrival, was indeed something to watch. The bulk of the service routes started from there, with vehicles all lined up in echelon, when it looked like the last ferry passenger had come out (and not until) the inspector would blow a piercing whistle (audible all round the terminal), following which up to 10 Leyland engines would instantly roar into life together, and they were off, like a Le Mans start, close manoeuvring, gestures between crews, all pushing across Borough Road together and then fanning out to the different routes. There must have been one or two collisions there from time to time. Regarding this longstanding Liverpool perception of "posh" Wallasey, goodness knows how that originated about a place which was principally dreary red brick terrace houses, and which had no logical centre. You make it sound like Formula 1, Bill!